Nitrogen (N) is one of the components of certain substances, largely derived from the excretion of fish, that are dissolved in water. These substances, of varying structural complexity, are quickly converted into ammonia (NH3 or NH4+), which is highly toxic for animals. At this point oxygen and bacteria intervene to convert the ammonia into nitrites (NO2-), which are also very toxic. Other bacteria, still accompanied by oxygen, transform them in their turn into nitrates (NO3-), slightly toxic for fish but which can be used by plants as nutrients. These transformations, taken as a whole, are referred to as the nitrogen cycle. In nature, land-based elements can also participate (see diagram). As plants are at the base of the food chain, they also take part in the nitrogen cycle. In an aquarium, the situation is different. Some fish partly feed on plants, but most of them are fed by the aquarist; sometimes there is a surplus of foodstuffs and the nitrogen cycle is altered as a result. It is very important to respect the equilibrium of this cycle. That is why you should not keep too many fish and you should not overfeed them. 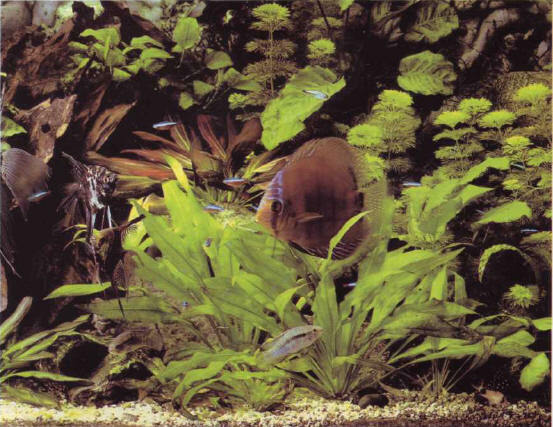 It is also a good idea to provide the aquarium with a sufficient amount of vegetation, and to enhance the development of bacteria, while ensuring that the water is well aerated. Partial and regular water changes make it possible to eliminate surplus foodstuffs, various types of organic matter, and any nitrates that have not been used by the plants. A biological filter enhances the development of the nitrogen cycle. Rarely found in open water (around 1% of the total count), bacteria colonize essentially the floor and the decor. They feed on nitrogenous compounds in the water, extracting the oxygen from them.When an aquarium is brought into use, bacterial colonization of the environment is a slow process, and so it is advisable not to introduce the selected fish until 2 or 3 weeks have elapsed. Nitrates, the final products in the nitrogen cycle, are used as mineral salts by the plants. 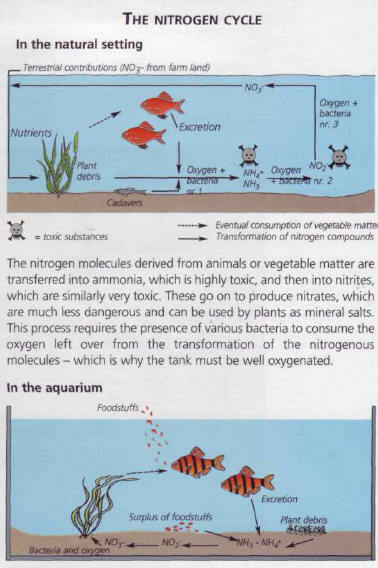 The concentration of nitrogenous compounds in an aquarium is higher than in a balanced natural setting, and there are some limits which must not be exceeded (see table above). Ammonia is found in two different forms in water, and the sum of the two must not be more than 0.4 mg/liter. Dissolved NH3 ammonia gas is the most dangerous, although it only appears above a pH of 7 and rarely exceeds 10% of the total ammonia. The more common ionized NH4+ form is slightly less dangerous. ЖИАРДИЯ , то же, что лямблия.